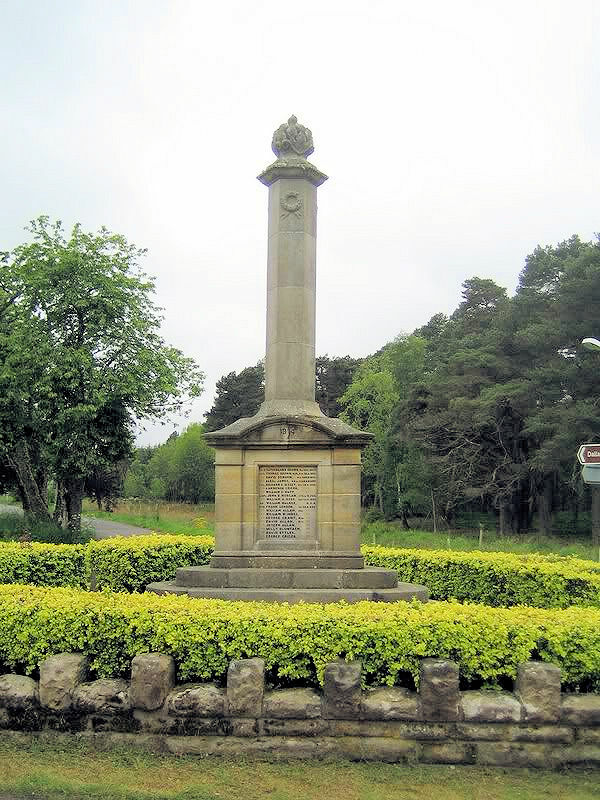 Although I have Garrow, Petrie, Grigor, Gow, Innes and Denoon links to the Dallas and wider Moray region the name Andrew Izatt stood out, when I looked at my images of Dallas, Moray war memorial. The above-mentioned names were included on the memorial and as there were no Riach’s listed I decided to tell you a little about Andrew Izatt. Andrew was born in the latter part of 1890 in Dallas, Elginshire. He was the son of Andrew and Annie Milne Izatt nee Shand. Andrew senior, son of Andrew Izatt and Rachel Gain, was born around 1861 in Whitburn, Linlithgowshire and was employed as a school teacher. Annie, on the other hand, was born around 1865 in Ordiquihill, Banffshire. As well as Andrew junior, Alexina Shand born in 1876 was also included in the 1891 census entry – Alexina being Andrew snr’s sister in law. By 1901, Andrew jnr. had two siblings – Meta aged 8 and Ella, just three months old. The transcription for Andrew has him as 18, but he is more likely to be around 11-year-old mark, working on his birth being late 1890. Also included in the census is Maggie Agilvie, probably Ogilvie, of Dallas, who is the families servant. Andrew snr. is now the Head Master of Dallas School – who could have possibly still been the head of the school when my grandfather John Riach was of school age. Sometime before February 1915, Andrew set off for Canada. There is a St. Albans, Vermont entry for an Andrew Izatt aged 23 born in Dallas, Scotland who arrived on SS Grampian (?) in July of 1910 – this gives a couple of years leaway on age. There is also striking difference, in a another document, which I will go into detail later – information to Andrew’s description. Andrew declared 1$ and told he had never been arrested or deported from or excluded from any admission to the USA. He gave Moose Jaw as his last addressed, telling that he had no relatives in America and he had paid the price of the crossing by himself and gave his occupation as labourer. Andrew Attested in Calgary on 9th March 1915 before Geo. Morfett (?) Approving Officer and Justice. Andrew declared he was from Dallas, Morayshire, giving his date of birth as 1st Nov. 1890. He gave his father as his next of kin and gave his trade as a dairyman. He also stated he had done 3 years with the 6th Gordons and duly signed his name. ~The second page of the Attestation a description of Andrew – he was 5′ 6″ tall with a fully expanded chest of 36 ½”. He had a light complexion, grey eyes and dark hair with a birthmark on his left thigh. He was a Presbyterian by faith. Now the height, hair and eye colourings differ on this document from the border crossing where he is described as 5′ 2″, fair complexion, brown hair and hazel eyes – not too much difference apart from he has lost four inches in height! Andrew served as Private 434940 in the 50th Bn. Canadian Infantry. He died on the 9th of November 1916 aged 26 and is remembered on the Vimy Memorial along with over 11,160 others who fought in the Canadian forces, with many of them in the fight for Vimy Ridge . The Memorial designed by W S Allward was unveiled by King Edward VII in July 1936 has a commanding view over the French countryside. The area leading up to the Vimy Memorial is set in a wooded area of which some is still cordened off to the public. The actual memorial stands proud on the hightest part of the ridge, overlooking the Douai Plain. In the lower areas of the memorial park are the underground tunnels and trenches once running busy with the acts of war. During a visit to the underground tunnels one of the Canadian guides said that the woodland area was planted with one tree for each Canadian soldier during the battle who lost his life. The guides at Vimy are Canadian students who spen time in France telling the history of the battle and the people. This entry was posted in General on January 15, 2017 by carol.